The approved supplier was quoting unacceptably longer lead-times as compared to the prior year, along with increasing unit prices. The end customer - a manufacturer of defense equipment. The item in question was a “mature” analog-to-digital converter that was being used in an ongoing program. An inquiry went out to the DATEL engineering group. Within days, the DATEL engineering department submitted a proposal for a 100% compatible device and became the preferred supplier for the product. The customer received a component with lower pricing, within a delivery time to meet production requirements. As the customer put it, the DATEL product provided all the benefits they hoped for in a new source, particularly because the previous supplier seemed disinterested in the business. 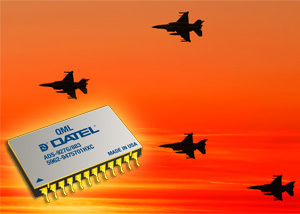 Shortly after delivering that single A-to-D converter, DATEL engineers were asked to develop four other military-temp microcircuits for the same program. Sole sourced? In need of a new supplier? We welcome the opportunity to see if we can help. Submit details of your requirements today.